Parthian are currently offering our new ebook edition of Dorothy Edwards' brilliant short story collection Rhapsody at 99p. For those who prefer physical books, this title forms part of the Library of Wales series. "Dorothy Edwards is one of the most remarkable and remarkably neglected authors in the English language of the early twentieth century. Though she was celebrated briefly in her lifetime, after her suicide at the age of thirty-one in 1934, her two books, Rhapsody of 1927 and the novel Winter Sonata of 1928, went out of print. The Virago reprints of the mid-eighties, with thoughtful introductions by Elaine Morgan, were crucial acts of rescue, but Edwards deserves more. [...] At least three of the 'Rhapsody' stories - 'A Country House', 'Days', and the brilliant, allusive and enigmatic 'A Garland of Earth' - are small masterpieces. All of them are extremely controlled studies of constrained desire, loneliness and incomplete relationships." - Christopher Meredith, taken from the foreword of the Library of Wales edition of 'Rhapsody', now available on ebook. 2012 mark 50 years since the publication of Raymond Williams’s seminal volume The Long Revolution (republished by Parthian Books earlier this year). On Friday November 2nd, The Burton Centre / CREW, Swansea University, will host a conference at the Dylan Thomas Centre entitled ‘Long Revolutions in Wales and Japan’. The conference is free to Swansea University students and staff and £10 for everyone else. Tickets available from the Dylan Thomas Centre. The event is part of the Dylan Thomas Festival 2013. Click here to read the October 2012 enewsletter online. 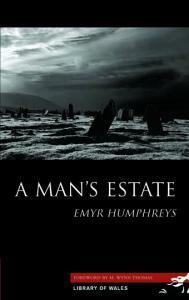 A Man's Estate is another clear and perfect reason to laud the gifts bestowed on Emyr Humphreys, the most detailed chronicler of twentieth century Wales, and author of capacious, intuitive fictions, properly lauded by such scholars as M. Wynn Thomas. A Man's Estate, though weightily brooding and unburdened by too much joy, or very much redemption, uses one corner of the country to examine the stuff of life, how troubling it can be, though how easily explained. We are always wanting. And found wanting. Maybe, in the final rub our wanting is who and what we are. Author, Broadcaster and Raconteur Jon Gower has undertaken the challenge to read all 33 titles in the current Library of Wales series, and review them. You can read his full review of Emyr Humphreys' A Man's Estate on Wales Arts Review now. The M. Wynn Thomas Prize is offered to celebrate outstanding scholarly work in the field of Welsh writing in English. There are two prize categories: the ‘Open’ category and the ‘New Scholars’ category. Essays submitted may be unpublished or published. Topics may include all aspects of Welsh writing in English as well as the inter-relationship of Welsh writing in English with cognate areas (Welsh Studies, history, cultural studies, film/media studies, translation studies, performance/theatre studies, digital humanities, comparative literature etc.). Shortlisted essays which are unpublished will automatically be considered for publication in the International Journal of Welsh Writing in English unless the author decides otherwise. The prize is awarded for a piece of substantial scholarship that is engagingly written. We encourage submissions that are ground-breaking in terms of subject-matter and/or methodology/disciplinarity. Essays that grapple with new ideas in an intelligent and conceptualised way are preferred. The prize is awarded at the annual conference of the Association of Welsh writing in English, which takes place around Easter every year in Gregynog Hall (near Newtown). The award is supported by the Learned Society of Wales, the University of Wales Press and Parthian Books. Essays in this category will be ca. 6,000-8,000 words long, of the highest scholarly quality and either already published in, or of a standard appropriate to an international, peer-reviewed journal. Authors may be academics and scholars who are not affiliated with an HE institution. Deadline: Essays must be submitted by email or by post by 15 December 2012. Our September enewsletter contains updates on news, events, book launches and special offers on classic titles in the Library of Wales range as well as related titles also published by Parthian Books. Click here to read the September 2012 enewsletter online. Library of Wales classic, The Vounteers follows Lewis Redfern, once a radical, now a political analyst and journalist, as he investigates the deaths of a worker killed in the striking coalfields of Wales, and a government minister thought to be connected with the death, and pursues the sniper through an imbroglio of Civil Service leaks and international wheelings and dealings to secret organization – a source of insurrection far more powerful than anyone could have suspected – the Volunteers. "Talking to my academic friend Claire Connolly the other evening we found ourselves discussing Lewis Jones' novels and she introduced me to the term 'sensational realism' and I thought how perfect, how extraordinarily apt. "Cwmardy is nothing if not sensational: it's like one of those Brazilian tele-novelas where one action-packed, or emotionally-soaked incident follows on from another at a breathless lick." Author, Broadcaster and Raconteur Jon Gower has undertaken the challenge to read all 33 titles in the current Library of Wales series, and review them. You can read his full review of both Cwmardy and follow-up We Live by Lewis Jones on Wales Arts Review now. Catch up: Read his review of The Dark Philosophers by Gwyn Thomas.